When ever I have logged in to Windows, there is one program which I use on a regular basis and which I cannot do without. The program is called Launchy. The unique feature of this program is that it helps me to navigate the file system, open applications, visit websites and a lot more by just typing a couple of keys. Launchy runs in the background as a service and is activated when a key combination is pressed. On my machine it is [Alt] + [Space]. In KDE, we have a similar program called Katapult. But if you are a GNOME user then you should check out a recent project which tries to equal or even surpass all the features found in Launchy. The name of the project is "Gnome Do". Simply put, Gnome Do is a launcher ... of applications, web pages, Firefox bookmarks, system config panels, your documents residing on your hard disk and so on. But you can also extend the functionality of Gnome Do using an add-in framework. Gnome Do is the brain child of David Siegel who started this project to be submitted to his university as a part of his curriculum. It has been entirely coded using C# and uses Mono. David Siegel claims he was motivated to work on Gnome Do seeing a similar project called Quick Silver on Mac OSX. I installed "Gnome Do" using the method explained in the official website and the installation was successful. If you are using Ubuntu, then you can download and install the binary instead of compiling the program from source. Once installed and running, Gnome Do acts as a background process waiting for the specific key press combination from the user. The default key combination is [Win Key] + [Space]. When you press the key combination, Gnome Do will make itself visible and you can start typing. It takes only the first couple of key strokes from the user to zero in on the correct application you wish to launch. For example, if I want to open Gedit text editor, instead of navigating the Gnome menu, I activate Gnome Do and type the first three characters namely 't', 'e'. 'x' and by then Gnome Do has zeroed in on the gedit text editor and all I have to do is press enter to open the text editor. 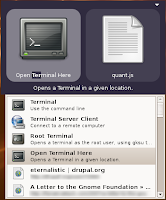 Fig: Type 't','e','r' and Gnome Do highlights terminal. When you press the hot key combination and bring Gnome Do to the foreground, you will find two boxes side by side. You can navigate between either of the boxes using the [Tab] key. And while one of the boxes have the focus, if you press the [Down arrow] key, it will open a drop down list which will list alternate actions that can be taken such as opening a terminal in the current location and so on. All applications in your Gnome menu are indexed. Supports an add-in framework so it is easy to write and extend the functionality of Gnome Do to suit your needs via pieces of code called add-ins. You can find a couple of add-ins at do.davebsd.com/addins. You have to place the add-ins in ~/.do/addins and restart Gnome Do. It keeps track of your Firefox bookmarks so you can start typing the first few letters of a bookmark and Gnome Do will open the webpage for you. Type an English word and it will open Gnome dictionary to give you the meaning of the word. You can open any file or folder in your home directory by typing the first few letters of their name and pressing enter. For example, to open my home folder, I press the hotkey combination and type 'r', 'a', 'v' and Gnome Do will open my home folder. Nice article. How would you like to contribute documentation to the project? You can also navigate into folders by selecting them and pressing the right arrow key. Thanks for the tip. But i prefer the deskbar applet that comes bundled with Ubuntu.